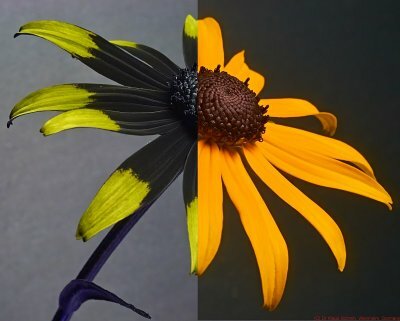 Today about composite shot of a decorative summer flower Orange coneflower - Rudbeckia fulgida in reflected ultraviolet photography using my "work horse" UV filter, the Baader-U filter. Lens was my CERCO 94mm quartz flourite lens. Light source was a modified for high UV output Xenon flash. All shots were done at f8. This attractive flower shows its very prominent UV bullseye pattern, its petals have an UV dark bottom and very UV bright tips (around 365nm), invisible to us humans, but very visible to bees and butterflies, and all this gets nicely visible. BBC Channel Four has recently produced and aired their three episode series "Colour: The Spectrum of Science ". The last episode "Beyond the Rainbow" has been aired on November 18, 2015 and deals with invisible colors, resp. IR and UV, the latter also about using reflected UV for behavioural reasons (starling) and pollination (bees). 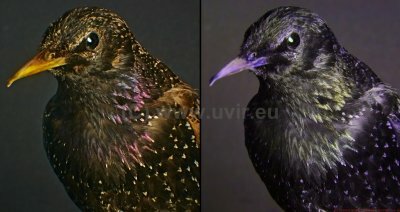 I have consulted the production team about the latter and have photographed and shown them the European starlings UV pattern (I wrote about that HERE ). The colours that we see are only a fraction of what's out there. Beyond the rainbow there are colours invisible to our eyes. In this episode, Dr Helen Czerski tells the story of scientific discovery. To see the universe in a whole new light, Helen takes to the skies in a NASA jumbo jet equipped with a 17-tonne infrared telescope. We can't see in ultra violet, but many animals can. Helen explores what the world looks like to the birds and the bees. With the discovery of x-rays we could look inside ourselves in ways that previously had only been possible after death. Today those same x-rays allow us to examine life at the atomic level, helping to develop new drugs and better materials. Ultimately, by harnessing all the colours there are, researchers are beginning to image the human body as never before, revealing new ways to treat disease." A wonderful production certainly worth watching!